We kneeled on a wooden platform, leaning into deep pools where a pair of Atlantic Bottlenose dolphins swam. The dolphins came to us on cue, talking and splashing as we learned about them and fed them fish. Then they rolled over on their backs so that we could rub their tummies. This moment took place at the Institute for Marine Mammal Studies in Gulfport, Mississippi, one of many great places in North America where families can touch, feed and swim with dolphins. Institute for Marine Mammal Studies – Gulfport, Miss. We like the Institute for Marine Mammal Studies because of the education value and the options for younger children. Children as young as 5 may participate in dockside programs, albeit in the company of an adult. If your child is between at least 8 and 48 inches tall, they can get in the water with the dolphins; the water will be no more than chest-deep on the smallest children. The program is available April through October, with summer camps offered. This particular facility was devastated by Hurricane Katrina in 2005, and received new dolphins in 2012. You and your kids will enjoy the heartwarming story of how eight dolphins that were washed out to sea with the hurricane stayed together and were rescued a few weeks after the storm. The book is called “The Eight Dolphins of Katrina,” by Janet Wyman Coleman and published by Houghton-Mifflin. 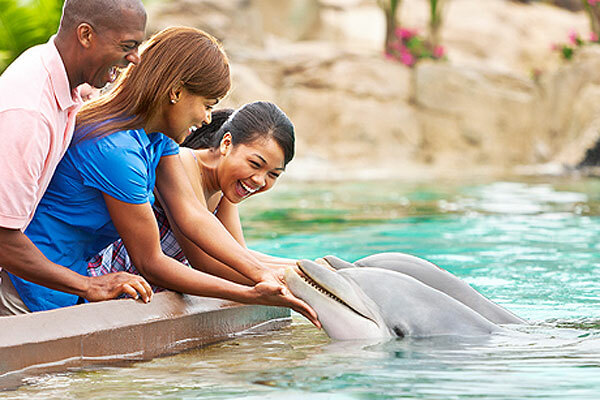 After reading about the Eight Dolphins of Katrina, your hearts will be drawn to Dolphin Cay at Atlantis. This 14-acre playground is where those lucky dolphins now call home. There’s an interaction for people of all ages and comfort levels in the water. Your youngest ones may prefer the 30-minute wading program where they can simply touch and watch the dolphins perform up close. If your children are under 10, you’ll need to accompany them in the water. The deep-water swim is so cool for two reasons: First, you’re in deep water where the dolphins are most comfortable and active, but second — each participant swims along at super fast speeds with a personal water scooter. Basically, it’s a handheld little motor that speeds you along at about 5 mph, the average speed for a dolphin on a leisurely swim. Your kids must be good swimmers and at least 10 years old to participate. Atlantis also offers two levels of “trainer for a day” programs and some fun interactive programs with sea lions. Clearwater Marine Aquarium – Clearwater, Fla. While most dolphin encounter experiences are in coastal areas, the land-locked Indianapolis Zoo provides a 35-minute, in-the-water experience that requires no swimming skills. If your child is at least 54 inches tall and 6 years old, he or she can do this, as long as you accompany your child. There are only eight people in the indoor pool at a time, so there’s plenty of personal time with the dolphins of Indianapolis. SeaWorld, of course, is all about education and appreciation of all sea life. The in-water dolphin interaction programs at Orlando, San Antonio and San Diego are for those 10 and older and at least 48 inches tall. You don’t have to be able to swim, but you need to be comfortable in chest-deep water and stay calm if you are splashed by the dolphins. 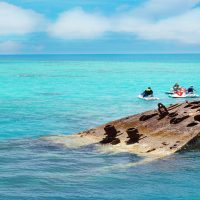 You’re only in the water about 20 minutes and must make reservations months in advance, which are both shortcomings of these programs. 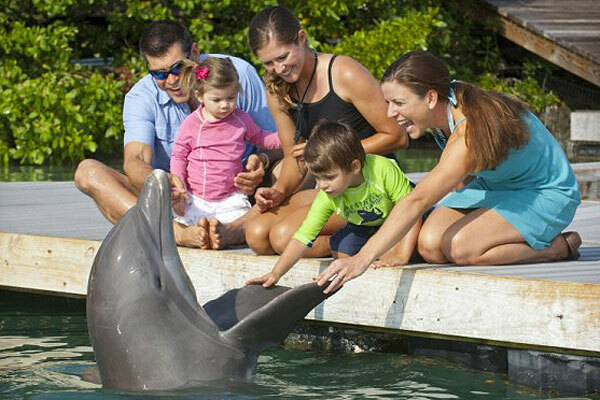 Otherwise, two edge-of-the-pool programs allow an up-close photo and opportunity to touch and feed the dolphins. 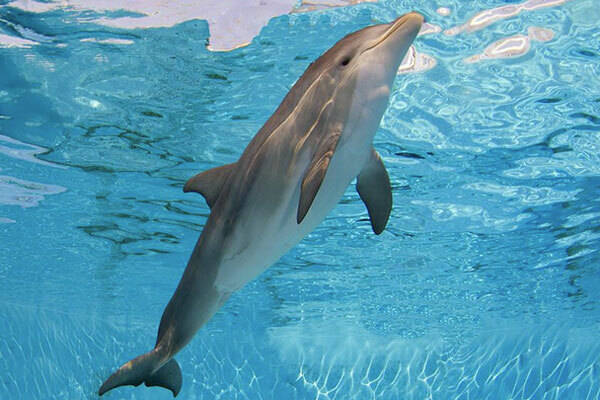 Located on Oahu, the Hilton Waikoloa Village Dolphin Quest programs begin at 10 minutes for two year olds and up to a five-day dolphin trainer program for those 12 and older. There’s something for all ages and price ranges from about $60 to more than $3,000. Anyone under 11 must be accompanied by an adult, so the family swim package for a family of five and your own personal dolphin is a pretty good deal. This is one of the few places where children 8 and older can play with two dolphins at once. It’s called the Royal Dolphin Swim and you spend about 30 minutes in the water being kissed, splashed, tugged and towed by two friendly dolphins. Other programs at Sea Life Park in Oahu offer opportunities for younger children and less interaction, but for the well-behaved child who really loves animals, this is the place to double the fun. Marineland Dolphin Adventure – St. Augustine, Fla. Affiliated with the Georgia Aquarium, the eight programs at the Marineland Dolphin Adventure in St. Augustine, Florida, offer experiences for children as young as 3 years old. For those who are a little afraid of the water, there’s a wonderful art program where your child holds a canvas and chooses the colors for the dolphin to paint. However, for teenagers who want more than the opportunity to pet and feed a dolphin, a program that debuted in 2013 allows teens between 13 and 17 to kayak through the intercoastal waterways while studying the ecosystem in which the dolphins live, and of course, interact with dolphins as they investigate them and their kayaks. 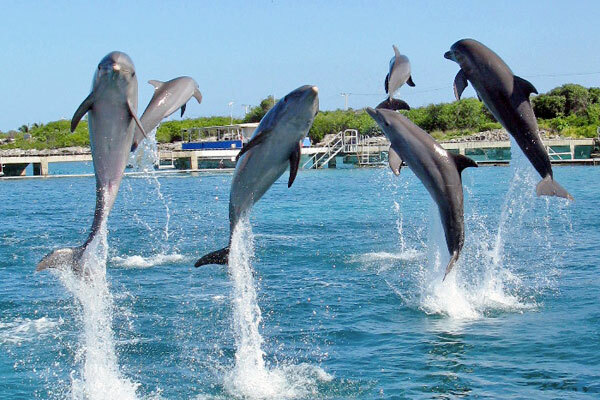 The Florida Keys are an incredibly popular place for dolphin interaction programs. Among the highlights is Hawks Cay Resort, which is affiliated with and shares property with Dolphin Connection. Many guest rooms offer a view of the dolphin pool, so at any time you can see the dolphins swimming around. 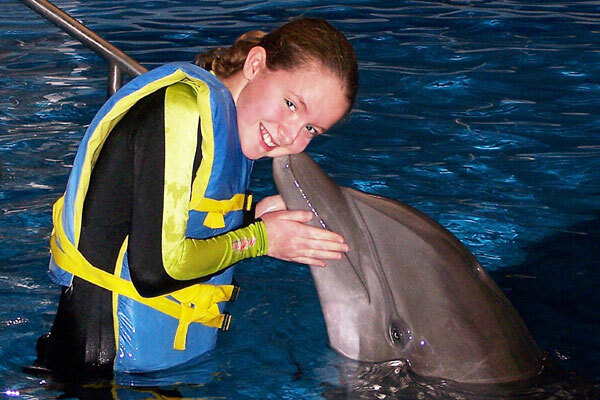 The dockside program allows you to bring infants to the pool to get a kiss from a dolphin. Children get to feed the dolphins and shake their fins without getting into the water. Islamorada, Florida was the first place we swam with dolphins, and we probably enjoyed it more than any child in the park. There are four options at Theater of the Sea: to paint with a dolphin; to sit at the side of a pool and pet/kiss the dolphin; to wade with dolphins in 3 to 4 feet of water; or swim with dolphins in a lagoon that is about six feet deep. Children as young as 5 years old may participate in any of these programs, but your child must be very confident in the water to participate in the lagoon swim. For example, the dorsal tow, offered at several dolphin encounter programs, requires the ability to tread water while the dolphin approaches and then some solid upper body strength to hang on to that dorsal fin while the dolphin tows you around the lagoon. 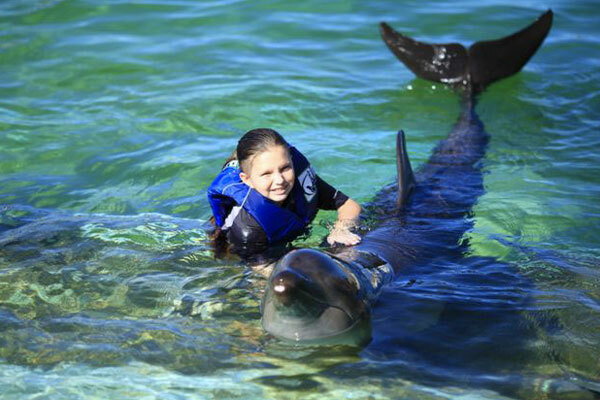 Dolphins Plus and Dolphins Cove are sister facilities in Key Largo, Florida, which allow kids as young as 3 years old to wade in shallow water with a dolphin while petting and posing for pictures. 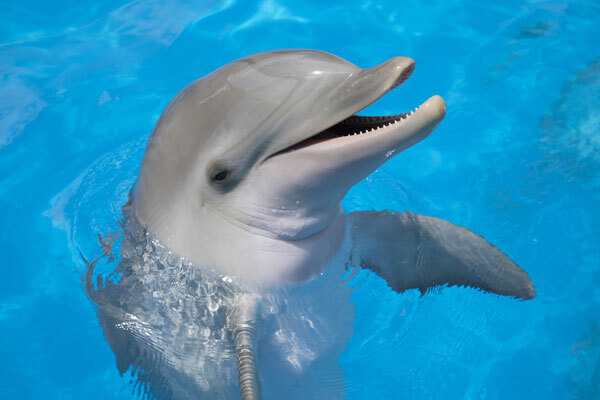 The structured swim option is for those who are at least 7 years old, and includes discussion of a dolphin’s environment, intelligence and anatomy. 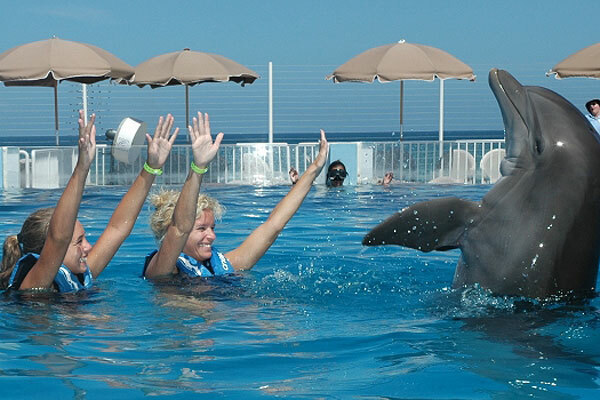 Dolphins Plus and Dolphins Cove also offer the chance to get in the pool and swim with dolphins. Put on a snorkel mask, paddle around, and the naturally curious dolphins will play with you on their terms. The Dolphin Discovery Group operates 15 marine parks in Mexico and the Caribbean, including Cozumel, Riviera Maya, Los Cabos, Grand Cayman, Anguilla and St. Thomas. Children between 1 and 5 may participate in these programs at no charge, as long as they stay in their parents’ arms. The group is recognized for its socially responsible care of marine mammals and for successfully rescuing sick and injured dolphins throughout the region. Additional Tips: Moms, if you happen to be pregnant, you will be excluded from most dolphin encounter programs. So will your children or anyone else in your family if they have the sniffles or are just getting over a cold. And always remind yourself and your children that dolphins, no matter how sweet and friendly, are indeed animals, and their behavior cannot be guaranteed. Children who are calm around animals will have a better experience.